Bringing my farmhouse dreams on an apartment budget to life one DIY project at a time. It all comes down to a vision. When I lock into one, it’s on and the real fun begins. 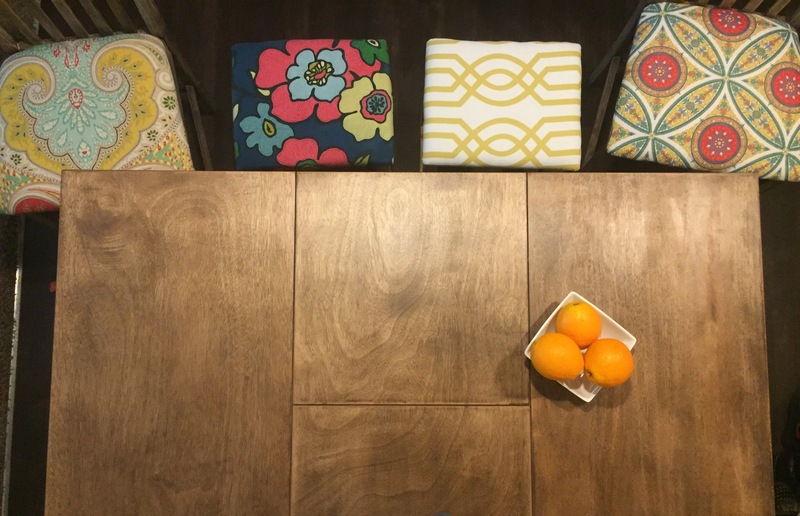 Re-upholstering the kitchen chairs was one fun project to undertake especially since my vision included mismatched seating and building two new stools to complete the refinished table project. This beautiful dining setup took my breath away. Besides the rush of natural light, the mix of bright and bold print along with the weathered table and chairs is a winning combo in my book. I had to have it and since this particular print is way above my budget, I had to adjust. Hey, I’m used to fiscally adjusting, so it’s no probs. I knew I wanted bright and bold floral types of print. 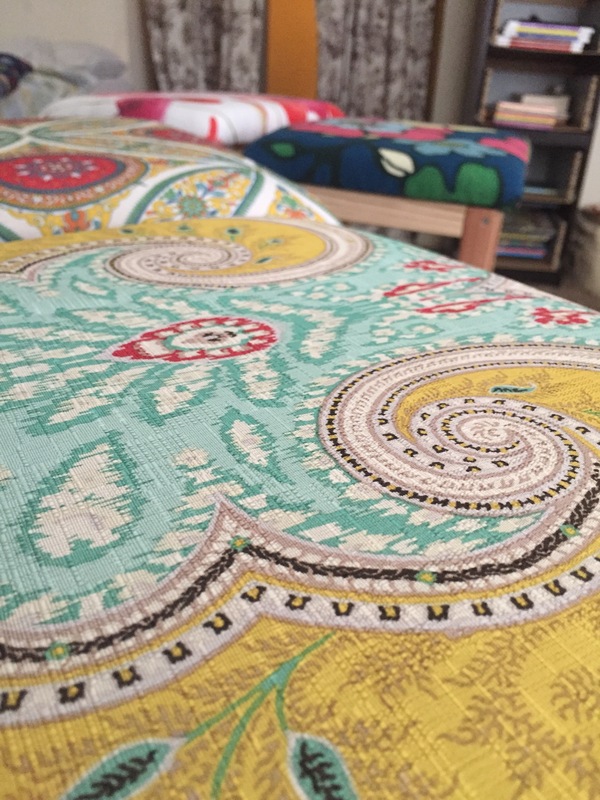 I always intended to use table cloths or shower curtains for my upholstery fabric since it is easy to wipe down. I still have two young boys who have holes in their chins. 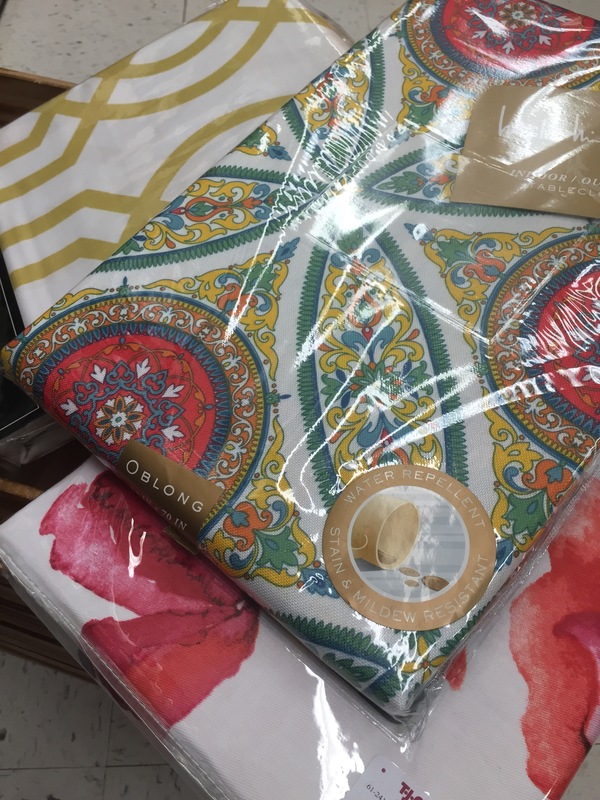 No luck with the laminate table cloths (absent of cute prints) or outdoor fabric (expensive) but found the mother lode in affordable, beautiful, water and stain resistant cotton table cloths at Marshalls, TJ Maxx, Ross and Burlington Coat Factory. In the end I used both table cloths and a shower curtain! (Yep. can you tell which one?) to upholster the stools and re-upholster the chairs. Remember these aren’t your mama’s shower curtains. The two bar stools were built using these plans from Rogueengineer.com. Although I made my seating a bit wider than their plans called for, I loved their easy, simple, visual instructions. As a newbie it worked perfectly. For the seats, I used left over plywood from the storage bed build project and had it cut to size at Lowes. I also loaded up on a staple gun and staples. Then off to buy batting and foam from the fabric store. Since the two original chairs already had batting and foam, I only needed to cut off its old fabric, measure and staple the new. Taking out the staples on my two kitchen chairs were probably the most challenging part of this upholstery project. Oh yeah, choosing which fabric would go where was a bit exhaustive not from intensive labor but from indecisiveness and fear of making a bad choice. In the end, I am satisfied. My farmhouse dreams on an apartment budget are shaping up. 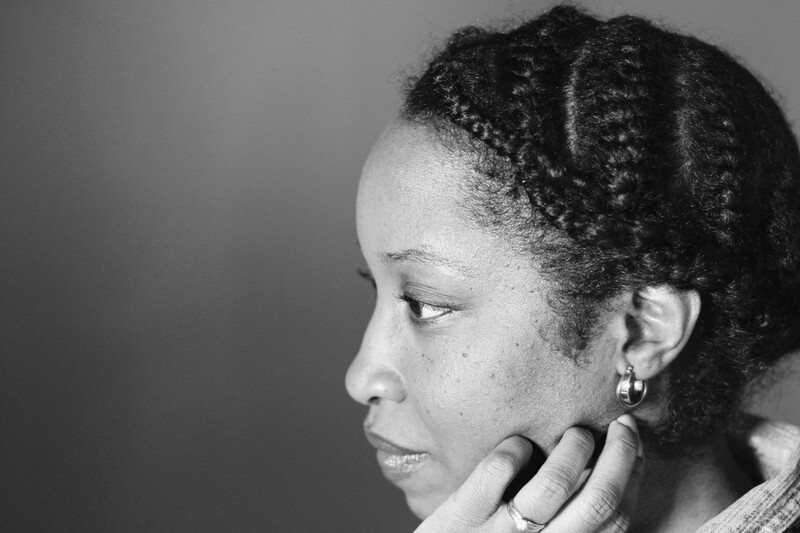 My DIY Epiphany: Trust your instincts. Take the risks. You have the advantage of changing something you don’t like anytime you choose.